#SaintPetersburg. #StPetersburg. #Faberge. #CarlFaberge. #FabergeCompany. #FabergeMuseum. #FabergeEggs. Private walking tour around St.Petersburg Russia. What to see in St Petersburg Russia. Things to see in St Petersburg Russia. things to see in St Petersburg Russia. The Faberge Eggs are stunningly beautiful, unbelievably expensive and … absolutely useless. You can’t even put them on as a ring or a bracelet to decorate yourself. 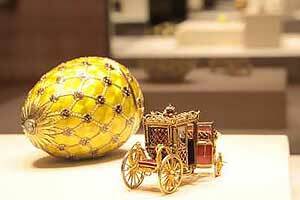 The best jewellers of the best jewellery company worked 15 to 17 hours a day for a whole year to create a single egg. Gold, enamel and diamonds of the best quality were used. At the same time the majority of people in Russia lived below the poverty level. After the Russian revolution of 1917 no more Faberge eggs were produced or could be produced despite the fact that Carl Faberge himself and many of his masters survived the revolution. Those eggs could be commissioned and made only in the society which existed in Russia before the revolution. The collapse of that society was also the end of the Faberge Company. Another famous collection of the Faberge eggs (14 eggs) was assembled by Malcolm Forbes. In 2004 the collection was bought by a Russian billionaire Victor Vekselberg and moved to Russia. At the very end of 2013 the Faberge museum was opened in the Shuvalov’s Palace in St. Petersburg. Nowadays the Faberge Museum has the largest and the most famous collection of the Faberge eggs – 14 Easter Eggs (9 of them are Imperial eggs). Besides the eggs the museum displays other masterpieces produced by Carl Faberge and his company (about 200), and also jewellery, porcelain and even paintings by his most famous contemporaries. During the tour you will get detailed information about Carl Faberge, his company and his most famous pieces of jewellery. At the same time you will see the stylish rooms of the XIX century Russian Palace enjoying the extreme beauty of the world famous jewellery and feel the atmosphere of luxurious life of the high society of Russia just before the Revolution. The tour of the museum will take about one hour and should be booked in advance.